In a battle of the analysts, the bullish side mounted a late-month comeback but failed to overcome a bearish mood. What's next for the high-speed networking expert? 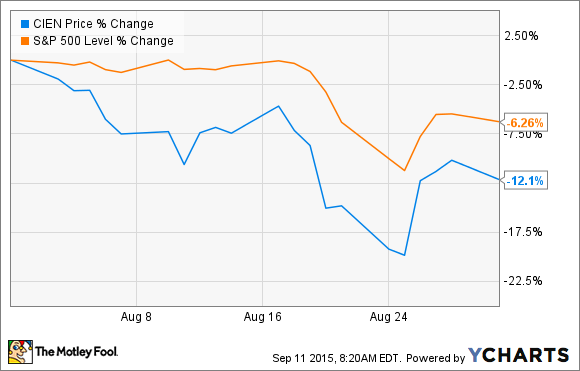 What: Shares of Ciena (NYSE:CIEN) fell 12.1% in August according to data from S&P Capital IQ. The maker of long-haul and optical-networking equipment dipped as much as 19.8% before making a spirited comeback at the end of the month. So what: On Aug. 3, Ciena completed the $415 million acquisition of software-defined networking specialist Cyan ahead of schedule. By the end of that week, Zacks downgraded the stock from a "buy" to a "hold." The firm cited tough competition, a risky reliance on a handful of very large customers, and the ongoing macroeconomic turmoil in Europe. That started a long, slow decline in Ciena's share prices. Later, the stock made a 10% single-day jump to the upside as analyst house Raymond James outlined reasons to buy the stock at reasonable prices. But that wasn't enough to erase the earlier slide. Now what: The company reported third-quarter earnings in early September, beating Wall Street's earnings targets but pushing a large chunk of expected revenues into future quarters. The report could be read in both bullish and bearish lights: Several analysts followed up with positive notes, but at least one firm downgraded the stock to a "hold" rating. To explain the revenue shortfall, Ciena CEO Gary Smith highlighted "the timing of network implementations at certain large service provider customers." Elsewhere, Smith clarified that the missing revenue was not lost but kicked down the calendar as the unnamed but very large customers adjusted their network upgrade schedules. Diving even deeper, Smith explained that it wasn't just one large customer hitting the brakes unexpectedly, but "three or four" of them at the same time. In the long run, this business should roll back to Ciena. Specifically, Ciena's largest customer, AT&T, placed"very, very strong" orders in the third quarter, preparing for a heavy round of network upgrades. The problematic customers are found elsewhere. Large cable companies would be a good guess, but Smith refused to really tip his hand. With rapidly rising cash flows, the promise of strong but delayed revenue boosts, and forward price-to-earnings ratios hovering near multiyear lows, this could be a great time to pick up some Ciena shares. You'd have to accept Smith's projections of future orders from the telecom and cable industries. To me, that's no problem since we're standing on the doorstep of 5G wireless networking and large-scale fiber installations for the hardwired crowd.